The excitement of the Mexican Riviera and wildlife-rich Sea of Cortez await you on a Holland America Line Mexico cruise vacation. Revel in the pulsing energy of Puerto Vallarta, Mazatlan and Acapulco, and then relax in the quiet beauty of the Sea of Cortez with unique, off the beaten path destinations like La Paz, Loreto, and the Copper Canyon. Throughout Mexico discover historic sites, shop for local treasures, and enjoy all manner of beach and water activities. Perfect for family vacations, our award-winning shore excursions and onboard amenities allow every guest to experience a tailor-made Mexican cruise fiesta. Holland America Line offers a variety of Mexico cruise itineraries from 7 to 14-days, all beginning and ending in downtown San Diego where the pier is conveniently located just minutes from the airport on beautiful San Diego Bay. Begin and end your cruise sailing past Coronado Island, Cabrillo National Monument and Point Loma. 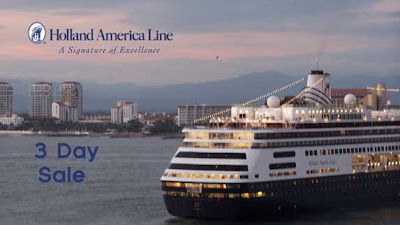 Holland America Line will have two ships in the Mexican Riviera for the 2010 sailing season: Oosterdam and Zaandam. The sailing season goes from January 2nd with Oosterdam sailing a 7-day round-trip from San Diego and ends with a 14-day repositioning cruise from San Diego to Vancouver again aboard Oosterdam. Whether this is your first trip to the Mexican Riviera or a return trip, you will truly enjoy the color and scenery of this part of the world. We have been there several times, and keep returning there. Experience it in style on one of Holland America's ships. Nothing says escape like the warm, welcoming islands and colorful cultures of the turquoise Caribbean. Princess® has a variety of festive voyages sailing eastern, southern or western Caribbean on six of their grandest ships in 2010 and 2011, visiting over 25 of the region’s very best ports. Frolic on white sand beaches and swim above reefs teeming with colorful sea life on islands such as St. Thomas, Antigua, Tortola, Barbados, Grenada and more. The convenience of Ft. Lauderdale, New York and San Juan. Princess sails year-round in the Caribbean and departs from a variety of convenient ports including Ft. Lauderdale, New York and San Juan. Choose from easy week-long sailings to a relaxing 14-day itinerary. For an extensive Southern Caribbean exploration, departures from Barbados are also available. 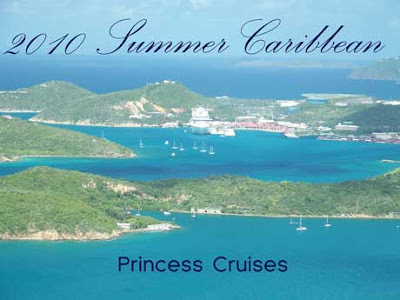 The Princess Caribbean fleet includes some of the best ships in the region. The magnificent Ruby Princess® sails 7-day Eastern Caribbean voyages from Ft. Lauderdale. Caribbean Princess® sails two alternating 7-day port-intensive Southern Caribbean itineraries from San Juan. Crown Princess® sails a week-long Western Caribbean itinerary, Emerald Princess® sails on two alternating 10-day itineraries to the Eastern and Southern Caribbean, Sea Princess® a range of 14-day Eastern and Southern voyages from Barbados and Grand Princess® the immersive 14-day Caribbean Collection from Ft. Lauderdale among other options. Whichever ship you sail, you’ll enjoy warm, welcoming Princess service and wonderful amenities including Movies Under the Stars,® the adults-only retreat, The Sanctuary, the freedom of Anytime DiningSM and more. Princess Cays® — a private paradise in the Bahamas. All 7- and 10-day sailings from Ft. Lauderdale feature a call at Princess Cays,® Princess own Bahamian paradise where the relaxing options range from sunbathing and shopping for crafts to volleyball and snorkeling. Warm Sandy Beaches are Calling You! Why not grab a group of your friends and plan a Caribbean vacation for next winter. There are special offers for early booking and groups. For more details, visit me on Facebook and my website. Have you ever considered trying river cruising? If so, take advantage of this special offer for booking your 2010 cruise. 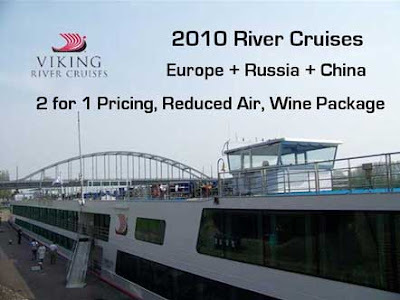 Viking River Cruises itineraries and services provide an excellent value. Hurry! Limited-time Offer! Just book & pay in full by May 31, 2009. Various restrictions apply; contact me for complete details. A few days ago, I announced the ability to begin booking on Norwegian Epic. Now, I'm offering you a sneak peek at this new ship. Click on the banner or on the link to learn more about Norwegian Cruise Line and while you are there, once again, click on the banner to go to a customized website that provides an insider's look at this engineering wonder. This is not just another new ship. This is a step forward. This is cruising re-imagined, with a ship unlike any other. This is world-class entertainment that is way beyond your expectations. A wide array of accommodations, with different levels of suites and staterooms having keycard-only access to private lounges, exclusive pool decks and the spa. And every oceanview stateroom is a Balcony Stateroom. Plus, discover the most diverse collection of restaurant choices ever assembled at sea. This is Norwegian Epic – the most spectacularly innovative ship in NCL's fleet or, quite frankly, any other. Be one of the first to experience the Norwegian Epic. There has been much attention given to the new travel requirements going into effect on June 1, 2009, and I would like to revisit this topic. In my previous post, New Passport Rules Starting June 1st - Are You Ready, I summarized the new rules, the list of 19 affected countries, and provided links to various government resources that would help you decide what documents are required in your particular circumstance. I'll repeat the links here for your convenience. In this post, I want to call out a couple of the caveats that I referred to in my previous post. I suggest you read both posts and visit the websites if you are not certain what requirements pertain to your circumstance. While the new Western Hemisphere Travel Initiative (WHTI) requires valid passports for land and sea travel, a final ruling was issued allowing leniency for “closed-loop” cruises, i.e., sailings that both originate and terminate in the same U.S. port. U.S. citizens taking “closed-loop” cruises are not required to have a passport but will need proof of citizenship and a government-issued photo ID, such as an original or certified copy of a birth certificate and a driver’s license. Children will also be required to carry a birth certificate and a photo ID if over the age of 15. Although a passport is not required for “closed loop” cruises, we strongly recommend all guests travel with a passport (valid for at least six months beyond completion of travel), a passport card or an enhanced driver’s license (EDL). Having these documents will enable them to fly from the U.S. to a foreign port in the event they miss their scheduled embarkation or to fly back to the U.S. if they need to disembark the ship mid-cruise due to an emergency. If a cruise begins and ends in different U.S. ports or begins and ends in a foreign port, a valid passport or other recognized WHTI-compliant document is required. A valid passport is required if you are traveling on any Europe cruise. I cannot emphasize enough that you need to take both land and sea requirements into consideration when deciding what document you need to satisfy the new WHTI rules. In my previous post and above, I've already cited a couple of very common situations where the unexpected can find you traveling by plane instead of by sea. In emergency situations like these, the last thing you want is to be denied boarding due to the lack of proper documentation. You may be denied boarding if you do not have the proper identification. I suspect that there will be some delays in boarding as the rules take effect, but after they have been in effect for awhile, this should speed the boarding process at airlines and cruise ports across the world. Finally, don't forget to complete your online cruise check-in, providing the passport numbers. This will help the cruise line comply with government manifest requirements and also speed the boarding process. Where do you want to go on your next cruise vacation? Holland America Line has announced a three day sale now through Friday, May 29th. Virtually all of their destinations are on sale with special pricing and other offers. Perhaps one of the following offers might appeal to you. There are way too many cruises to list in this blog, but I'd be happy to provide details on any of the itineraries - just call or email me for more information. Get an outside for the price of an inside! Upgrade to a Verandah from an Ocean View from only $50 on select sailings! Plus enjoy limited-time savings on Verandah Suites! There are also special pricing on Caribbean sailings. Savings start today for Mariners. cuisine and the unforgettable scenic beauty China is known for. - Cambodia – explore some of the world’s most beautiful ancient temples. 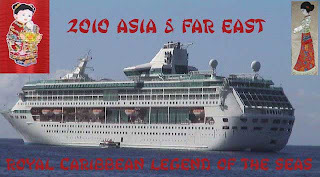 Royal Caribbean International released the 2010 Asia & Far East schedule today. Legend of the Seas® will be your floating hotel for your exotic Asian itinerary. So reserve your Asia cruise in advance, snag the best staterooms and plan the details of your vacation without the last minute dash. And don’t forget to add shore excursions to your voyage so you can see all the sensational nuances of this exotic locale. I'll be happy to help plan your cruise vacation to the Far East. NCL started it all with Freestyle Cruising® – where people can enjoy a cruise without being handed a schedule. A vacation where you are free to do whatever. And now they’re following one success with another. Welcome to Norwegian Epic: NCL’s incredible new ship that reinvents cruising yet again. You’ll want to be one of the first to experience this ship’s day and night entertainment where you can wander from one exciting venue to another. Aboard Epic, there are as many ways to have fun as there are to have dinner. And she’s got the most innovative and wide-ranging accommodations at sea. Norwegian Epic sails summer 2010. Be there. Are you ready for the most innovative living spaces at sea? Introducing Norwegian Epic’s giant leap forward in accommodations. Starting with the New Wave Staterooms, where curved walls meet a curved ceiling with soft recessed lighting and where every “outside” stateroom has a balcony. Then there are the three “private-access” stateroom complexes – each with a unique ambiance: The Studios transform inside staterooms into cool, urban spaces with windows to the corridor, mood lighting and access to The Living Room, where guests can kick back, watch a flat-screen TV and have a drink before dinner. The Spa Staterooms and Suites have 24-hour access to the Mandara Spa thermal suites and the fitness center right next door. And finally The Villas, hidden away on their own deck, are accessible only by private elevator and offer an exclusive, all-pampering experience with private bar, pool, sundecks and even a private gym. 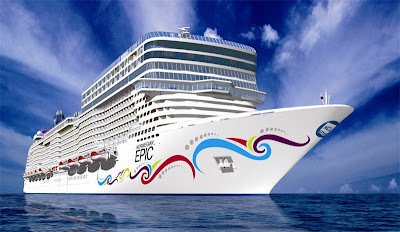 Norwegian Epic has opened for sale for Latitudes members with an exclusive offer. Through 8/31/09 Latitudes members will receive up to a 3-category upgrade with additional savings of up to $100 per person. Or, if booking a Suite they will receive up to $500 per stateroom to spend on board. Rates for Latitudes members start at only $599. For those not familiar with NCL, Latitudes members are guests that have sailed at least once before on any Norwegian Cruise Line ship. Blue Man Group to headline Norwegian Epic’s entertainment offerings. NCL is changing the face of cruise line entertainment on their next generation of Freestyle Cruising ship, Norwegian Epic beginning in summer 2010 . Blue Man Group, best known for their wildly popular theatrical shows and concerts which combine music, comedy and multimedia theatrics will be performing in the 685-seat Epic Theater. In addition, Norwegian Epic will have multiple, specially-designed entertainment venues throughout the ship so that guests can choose from a wide variety of entertainment each evening of their cruise. I am in the process of putting additional information together to share with you. If you need more information in the meantime, contact me via email or phone (see links for website details). After lunch we walked, with another couple from the ship, to St. Eusebius Church in the heart of Arnhem. The four of us toured the inside of the church. When you enter the church the first thing you see is the main pipe organ, the Strümphler organ, which dates back to 1795 and is the replacement of the Wagner organ from 1770 which was destroyed completely in WWII. There are five columns that house the pipes. Each of the towers are adorned with angels. The church was extensively damaged during the Second World War following Operation Market Garden in 1944, with the interior being completely burnt out. Later the tower, weakened by the fire, collapsed entirely. Following the war the church was restored between 1946 and 1961. The church is no longer used for religious services but rather is a tourist attraction, specifically commemorating the bravery of the paratroopers of the Allied forces who attempted to isolate the Germans by capturing the bridge across the river. The fourth picture from the left in the collage above, shows the Paratrooper memorial inside the church. The Eusebius Tower is an amazing feature of Arnhem. This is the high point of the city of Arnhem. It rose out of the ruins of the Second World War. It reached its highest point ever, 93 meters. In 1994, a glass elevator was added inside the tower up to the belvedere, a lookout point with glazed sides at 73 meters. Two of us paid the 2.50 Euro fee to ride up the elevator past all of the array of bells and into the loft of the church. We had a 360 degree view of the surrounding city from the observation tower. We decided to climb the additional steps, up a winding staircase, to the spire. You can see the steps and the view from the tower above and in our photo album. The view from there was phenomenal and worth the admission cost. Other items of interest in the church include the Mausoleum of Duke Karel of Gelre, the Salvator Bell (a gift from Duke Karel), and the the crypt below the building where you can (if you dare) find ancient human bones which have been left in the state of their burial or death. Needless to say, we skipped the last part of the self-guided tour. Arnhem was defintiely one of the highlights on our Tulip Time Cruise. History buffs will definitely enjoy the visit. Come back again to read about other stops on our Amalegro cruise. Welcome to the Province called "Gelderland"
Continuing our Tulip Time River Cruise on AMA Waterways Amalegro we next arrived in Arnhem, the capital of the province called Gelderland. Amsterdam, Volendam, and Edam were all located in the Dutch Province called North Holland. After Edam, we traveled south again, through the Markermeer, formerly part of the famed Zuiderzee, and we entered the Amsterdam-Rhine Canal. This canal is just over 50 years old, and connects Amsterdam to the lower Rhine River, where Arnhem is situated. The tour, Monday, April 13th, focused on what Arnhem is most remembered for: The Battle of Arnhem and Operation Market Garden. The events of this battle inspired the well known movie known as "A Bridge Too Far". The battle which took place in Arnhem in September 1944 was a disaster for the Allied troops and was a saddening part of modern Dutch history. On September 17, 1944, 10,000 men from the 1st British Airborne Division were parachuted into Oosterbeek, just west of Arnhem. They were to then march on Arnhem and secure a bridgehead on the Lower Rhine River. Under the direction of John Frost, Commander of the 2nd British Battalion, this bridgehead was to be held until the American and Polish troops could make their way up from the south. Scheduled to arrive were 20,000 Americans from the 18th, 101st, and 82nd Airborne Divisions, along with 3000 Polish soldiers, but they were delayed by unusually heavy fog. By the time they could arrive it was too late and the Americans destroyed the bridge to prevent Germans from using it. This very bridge became known as "A Bridge too Far", about which the movie was made in 1977. The bridge is now named the "John Frost Bridge". Our visit to Arnhem began with a bus trip which included a photo stop at the John Frost Bridge followed by a stop at the Groesbeek Canadian Cemetery. After visiting the cemetery we drove to the Liberation Museum in Nijmegen-Groesbeek. The Liberation Museum recreates the period before the war, the occupation during the war, and the liberation during 1944-1945. After the tour we returned to the ship for lunch and enjoyed the remainder of the afternoon on our own. I'll talk about the afternoon in another post. Our visits to the bridge, cemetery, and museum were very moving. Reliving history, especially that of World War II, has become one of our favorite cruise activities. 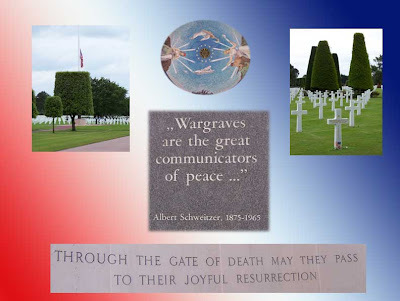 Perhaps it is because my father served in WWII and survived the D-Day landing and the Battle of the Bulge. This helps us to understand what sacrifices were made by the troops in those days. Disney Cruise Line® has announced plans to reposition the Disney Wonder® Cruise Ship from its base in Port Canaveral, Fla., to the West Coast in 2011. A two-year agreement, with a three-year extension option, was considered by the Port of Los Angeles Board of Harbor Commissioners on April 2, 2009. With the port's proximity to the Disneyland® Resort, you'll be able to enjoy even more magical Disney vacation choices - both on land and sea! The addition of a new homeport for Disney Cruise Line is part of the overall expansion plan for The Walt Disney Company. Two new ships, Disney Dream and Disney Fantasy, will arrive in Port Canaveral, Fla., in 2011 and 2012, respectively. Disney Cruise Line successfully tested the West Coast market with two summer seasons of Mexican Riviera cruises in 2005 and 2008. 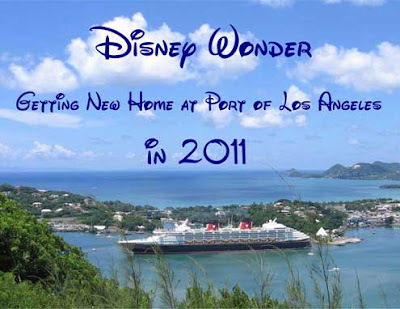 Disney Cruise Line has not yet announced the details of its itineraries for 2011. As soon as they are announced, I'll share that information with you. Carnival Cruise Lines will resume visits to Mexican ports of call based on the latest guidance from the Centers for Disease Control, which is no longer recommending against non-essential travel to Mexico. Once all voyages with previously modified itineraries are completed, those vessels will revert to their original routes featuring stops in Mexico. Most itineraries were modified through mid-June with the exception of the Holiday which was modified through late May. For full details on modified itineraries, and the effective dates for the return to the original itineraries, click here. In communicating this news to their travel partners, Carnival said "Please rest assured that the health and well being of our guests and crew is our highest priority and we are returning to Mexico after careful evaluation and consultation with the CDC. It is important to note that the concentration of H1N1 flu cases in Mexico has been inland rather than in the coastal resort areas where our ships visit." The cruise industry works closely with U.S. public health officials in the CDC's Vessel Sanitation Program in developing and complying with extensive policies and procedures that are effective in mitigating illness aboard cruise ships. Carnival will continue to follow CDC guidelines for cruise ships which include pre-boarding health questionnaires for all guests and crew, along with secondary screening by shipboard medical professionals as necessary. Additionally, all Carnival ships stock influenza test kits and anti-viral medications for treating type A influenzas. Carnival concluded their travel partner update by saying "We are very pleased to be returning to Mexico and would also very much like to thank you for your understanding and patience during the past few weeks." 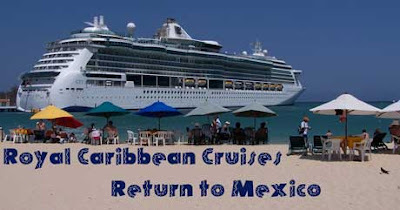 Royal Caribbean International informed their travel partners that they will resume its port calls in Cozumel, Mexico, beginning with sailings that depart on or after May 24, 2009. RCI applauded the decision of the U.S. Centers for Disease Control and Prevention (CDC) to downgrade their previous "Travel Alert" to a "Travel Health Precaution for Mexico." Their statement went on to say "Like our guests we are anxious to return to Mexico. Until then, our guests will have time to fully review and understand the CDC's decision." The ships with Cozumel port calls include Freedom of the Seas, Liberty of the Seas, and Enchantment of the Seas. Mariner of the Seas will continue its modified Pacific Northwest itinerary, up to and including, its June 14 sailing. RCI will continue to utilize the Influenza Prevention and Response Plans, which their office of Medical and Public Health developed in coordination with the CDC and other health experts. The plan is based on three pillars: Preparedness and Communication; Surveillance and Detection; and Response and Containment. Itinerary updates are provided daily at 1 PM. See the following link for latest update. Emerald Princess features alternating 7-day Eastern and Western Caribbean itineraries roundtrip from Ft. Lauderdale throughout the summer. Both itineraries visit Princess Cays®, an exclusive island experience in the Bahamas. Caribbean Princess returns with 9-day itineraries roundtrip from New York featuring visits to Bermuda and a special 7-day Eastern Caribbean sailing from San Juan to New York. In Summer 2010, you can enjoy voyages to Eastern or Western Caribbean islands on this exquisite vessel. Spend a week sailing our popular sailings of the region, visiting Grand Cayman, Cozumel and Jamaica – all featuring Princess Cays®. Relish more leisurely days at sea while you visit the irresistible islands of Bermuda, St. Thomas, Grand Turk and beyond. Sail during the months of May to July with departures from New York, making your Caribbean adventure as carefree as it is unforgettable. A delightful island retreat awaits your discovery on sun-drenched Princess Cays, featured on all 7-day Emerald Princess® Eastern or Western Caribbean voyages from Ft. Lauderdale. From snorkeling and kayaking to island cuisine and drink, there's something to do for the entire family. Are you a past guest on Princess Cruises? $50 per person discount for past passengers on 2010 Summer Caribbean voyages. Expires 12/31/09. Call or email me for more details about any of these summer cruise vacations. This summer, you can sail with popular Disney Channel stars aboard the Disney Wonder® Cruise Ship during the first-ever "Disney Channel Summer at Sea," presented by Kodak. 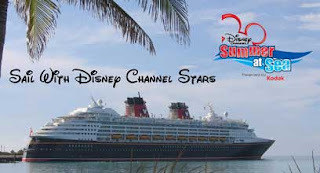 Popular stars from Disney Channel shows like "Hannah Montana," "Sonny With a Chance," "JONAS," "The Suite Life on Deck," "Camp Rock," "High School Musical" and "Hatching Pete" will join Guests on 3- and 4-night cruises beginning July 9 through Aug. 2, 2009. All eight sailings are available to book now with special fan activities included in the prevailing cruise rate. During the voyages, Disney Channel stars will participate in onboard deck parties and join Guests for Q&A and autograph sessions as well as preview screenings of Disney Channel programming. The onboard fun culminates with a "Party with the Stars" event, an evening in which Guests are invited to join the stars for a special musical performance by a Disney recording artist. *Schedule and talent subject to change. Not all stars available for each sailing. Let the Magic Begin this Summer aboard the Disney Wonder. Call or email me for details. Princess Cruises begins their Alaska Season this weekend offering passengers more local tastes and culture onboard than ever before, giving them a rich “Great Land” experience not only on land, but also while at sea. Princess’ 2009 Alaska season begins May 9 and runs through September 14, featuring a total of 130 sailings aboard Diamond Princess, Sapphire Princess, Coral Princess, and Island Princess traveling on the line’s signature Gulf of Alaska sailings; Golden Princess, Star Princess and Sea Princess sailing the Inside Passage routes from Seattle and San Francisco and Pacific Princess offering the line’s small ship experience on 14-day Connoisseur voyages to some of the state’s less-visited ports. Sanctuary Glacier Viewing Experience - Aboard Golden Princess, Star Princess and Island Princess, The Sanctuary will become a prime location for glacier viewing of the unforgettable Glacier Bay or Tracy Arm. It will offer passengers a variety of ammenities to make their viewing comfortable. It will be educational as Park Rangers and Naturalists will be on hand to provide commentary to Sancturary guests. A variety of special food and beverage offerings will also be avaialable. Award-winning video presentations – Passengers can learn more about the wonders of Alaska from the comfort of their own stateroom, with these specially produced videos, including a series of Telly Award-winning port videos. There are a limited supply of cabins still avaialable for the remainder of the Alaska Season. If you are interested in celebrating Alaska's 50th Anniversay of Statehood, I suggest you contact me very soon. This will be one of your most memorable cruise vacations ever, so don't let it pass you by. Norwegian Cruise Line's scheduled deployment does not include any ports of call in Mexico until the end of September 2009. However, they have proactively taken increased health and safety measures as a matter of caution. Fleet-wide guest screening via a health questionnaire prior to embarkation. Any guests exhibiting influenza symptoms which meet the Centers for Disease Control and Prevention's case definition of suspect H1N1 influenza will not be allowed to board the vessel. On-board education regarding H1N1 symptoms and preventative actions. An informative flyer is being placed in all staterooms fleetwide. A mandatory visit to the ship's medical center for further evaluation and treatment if necessary for those guests who may develop flu-like symptoms while sailing. On-board medical centers are stocking an appropriate amount of the anti-viral medication used to treat the illness, in the unlikely event the need for its use becomes necessary. Norwegian Cruise Line will continue to closely follow developments regarding the H1N1 Influenza. Additional information regarding H1N1 is available at the U.S. Centers for Disease Control and Prevention website: http://www.cdc.gov/. Carnival Cruise Lines has cancelled all port of call visits in Mexico for 16 of its ships that were previously scheduled to stop in that country. Itineraries for vessels departing between now and June 15, 2009 that included stops in Mexico have been modified. In many instances, the modification simply involved substituting an alternate port. For full details on modified itineraries, click here. Guests who do not wish to sail on a modified itinerary may opt to receive a refund in the form of a future cruise credit equal to the full amount paid for the voyage. The credit may be applied to an alternate sailing departing through the end of 2010. Compensation for missed ports/altered itineraries (where applicable) for guests who sail varies by itinerary. With four and five-day cruises from Galveston and New Orleans that are being converted to seven-day voyages, those guests may opt to receive their refund in the form of a future cruise credit or money back. Carnival Cruise Lines is dedicated to the health and safety of all guests and crew. The recent emergence of H1N1 flu has caused concern among public health authorities and the traveling public. Although there have been no suspected or confirmed reports of H1N1 flu on any Carnival cruise ship, we have proactively taken increased health and safety measures as a matter of caution. Carnival maintains close coordination with the U.S. Centers for Disease Control and utilizes very stringent recommended sanitation protocols to minimize the possibility of viral transmission of infectious diseases. Our onboard medical centers have supplies of antiviral medications, personal protective equipment and appropriate diagnostic test kits, as recommended by the CDC. For further information on H1N1 influenza, visit the CDC’s web site at http://www.cdc.gov/. Royal Caribbean International and Celebrity Cruises have temporarily suspending their port calls in Mexico. The decision was made in an abundance of caution, and to allow additional time to better understand the full impact of the Swine Flu. The temporary suspension involves four Royal Caribbean International ships currently making regularly scheduled port call in Mexico - Enchantment of the Seas, Freedom of the Seas, Liberty of the Seas and Mariner of the Seas. It also involves one additional Royal Caribbean International ship scheduled to make upcoming Mexico port calls as it reposition - Radiance of the Seas. The temporary suspension involves one Celebrity Cruises ship scheduled to make upcoming Mexico port calls as it repositions - Celebrity Infinity. I wanted to take this opportunity to update you on the enhanced screening guidelines the cruise industry is beginning to implement to continue ensuring the healthiest environment for all cruise passengers. It is important for you to know that the cruise industry is taking these proactive steps out of an abundance of caution to identify, isolate and treat any suspect cases as appropriate. Under new CLIA member cruise line health screening procedures, All passengers scheduled to board CLIA member line cruise ships will be required to complete the new public health questionnaire prior to boarding at any port. Under the enhanced screening protocols, CLIA member lines will perform a secondary screening if a passenger reports on the questionnaire flu-like symptoms, including fever, cough, runny nose or sore throat, or contact with a confirmed Influenza A (H1N1) case. Medical personnel at each cruise line will make case by case decisions regarding the boarding of these passengers. Passengers will not be permitted to travel if they exhibit influenza-like-illness or meet the suspect case conditions for swine flu as defined by CDC (http://www.cdc.gov/swineflu/casedef_swineflu.htm). All other passengers will be permitted to travel. If you have questions about these procedures, contact your cruise specialist or the cruise line. Further information on travel and the swine flu can be found on the CDC Web site at: www.cdc.gov/swineflu. CLIA will continue updating its communications as necessary and I will keep you apprised of any significant developments. The cruise industry always takes your safety and health seriously, so I am confident that with passenger cooperation, you will be assured of a safe and healthy cruise vacation during these difficult times. As I have said many times in this column, I stronly recommend the purchase of travel insurance. I offer my customers a customized Travel Guard policy which provides emergency assistance amongst the other benefits. Travel Guard has announced that it is Offering Free Assistance and Information on Swine Flu to U.S. and Canadian travelers affected by or concerned with the recent Swine Flu outbreak. They have the most up-to-date information for travelers seeking travel status updates, health warnings, prevention and treatment tips.